Make way for dinner parties, idle summer cocktails, and the optimization of fresh breezes to come with this Malibu Outdoor Patio 7-piece Wood Dining Set! Made from 100% Eucalyptus - a very durable Hardwood, this set that can stand up to all kinds of changes in the weather. The pores of the Eucalyptus is very dense; thereby it quickly repels water, and its natural oil combats and repels wood eating insects. Comes in the beautiful Natural Wood Finish, this set will be a great addition to your outdoor patio! The Bradley Outdoor Patio 7-piece Wood Dining Set is designed to be maintenance free. Every piece is carefully Finished with a beautiful, multi-coated and weather-resistant paint that will not fade due to over exposure in the sun. It will maintain its new look from the first day and for years to come. Made from 100% Acacia Hardwood that is native to Australia and Asia, and used in the construction to make excellent and high quality furniture that resists mold, mildew, fungi, termites, rot, and decay.Comes in beautiful White Painted Finish, this set will bring your outdoor patio a classic charming look, sounds perfect! 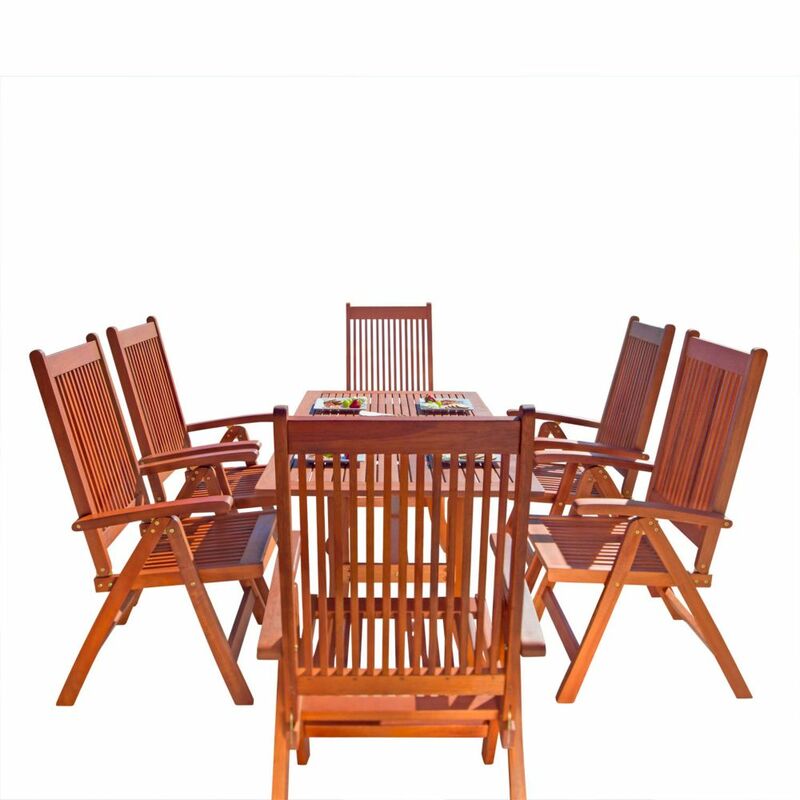 The Bradley Outdoor Patio Wood 5-piece Dining Set with Stacking Chairs is designed to be maintenance free. Every piece is carefully Finished with a beautiful, multi-coated and weather-resistant paint that will not fade due to over exposure in the sun. It will maintain its new look from the first day and for years to come. Made from 100% Acacia Hardwood that is native to Australia and Asia, and used in the construction to make excellent and high quality furniture that resists mold, mildew, fungi, termites, rot, and decay.Comes in beautiful White Painted Finish, this set will bring your outdoor patio a classic charming look, sounds perfect! Malibu Outdoor Patio 7-piece Wood Dining Set with Curvy Leg Table and Reclining Chairs Make way for dinner parties, idle summer cocktails, and the optimization of fresh breezes to come with this Malibu Outdoor Patio 7-piece Wood Dining Set! Made from 100% Eucalyptus - a very durable Hardwood, this set that can stand up to all kinds of changes in the weather. The pores of the Eucalyptus is very dense; thereby it quickly repels water, and its natural oil combats and repels wood eating insects. Comes in the beautiful Natural Wood Finish, this set will be a great addition to your outdoor patio!